As 2018 quickly makes its way to a closing, I find myself saying the same thing as I said the previous year “Where did the year go?” As we get older and life gets more complex, between work, family, and kids, I find that the constant responsibilities the world we live in employs so much of our time that life just flies by. How many times have you said, “There not enough hours in a day.” And as the universe surprisingly sends obstacles that abruptly cross our paths unexpectedly making our lives more challenging. Many of these obstacles that crossed my own path have caused me stress and despair, hence with epilepsy, I taught myself not to let the stresses of life get the best of me. We all could look back and focus on the negative. But where will that get us? More seizures, more injuries, and depression? Is it really worth the pain and suffering? I have found over the years the only way of surviving in this life with a disability or disorder is to focus on the positive. 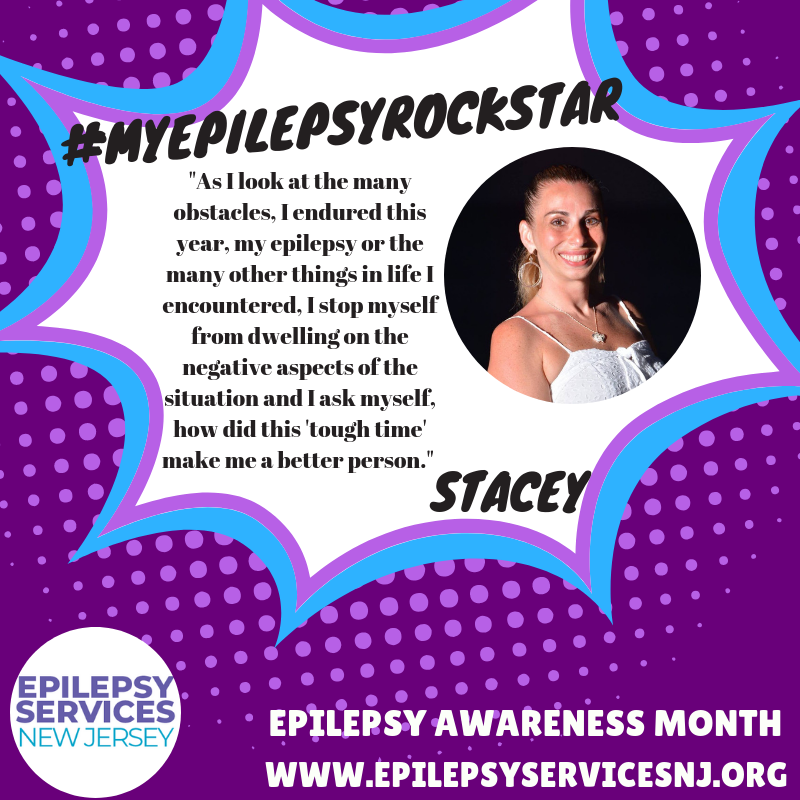 I have experienced hundreds of seizures, injuries, a couple of near-death experiences, and sadly the many restrictions epilepsy has put on my life, but I’m not going to let it stop me or get me down. I only focus on the positive. Focusing on the good things in life brings me joy and strength. It gives me the reason to look forward to now and the follow days to come. As I look at the many obstacles, I endured this year, my epilepsy or the many other things in life I encountered, I stop myself from dwelling on the negative aspects of the situation and I ask myself, how did this “Tough Time” make me a better person. All obstacles strengthen us. Well, many will say, “I’m strong enough. I don’t need to be any stronger than I am.” This may be true. However, what life lesson did you learn from it? I can truly say that with every obstacle I encountered I learned something new. Each challenge made me a better person. Reminded me why I do the things I do. It also made me realize why I need to continue doing all the things I do. Then think about the people in my life who are most important to me. With all of life’s obstacles, you endured who was there to help you? Who was your rock? When you accomplished something who were the people on the sidelines cheering you on? When you ventured into a new era of life who were the ones to support you and give you motivation and encouragement you needed while you entered unfamiliar territory? It’s these people who you need to thank. The people who make a difference in your life. The people who give you the strength and motivation you need to be the person you are today. The people who help you through your toughest times and continue to show their love and support. It is because of these people I am able to cope with my epilepsy. It’s these people who bring purpose into my life and most importantly, they taught me to love in a way I never thought never possible. In a recent study done by psychologists, it showed that people who incorporated gratitude into their lives obtained better health, sounder sleep, less anxiety and depression, higher long-term satisfaction with life, and kinder behavior toward others, including their partners. Another new study showed that feeling grateful makes people less likely to turn aggressive when provoked, which helps explain why so many people are happy and pleasant on Thanksgiving Day. Sadly, a majority of people in our society look out for themselves as number one and instead of being happy with what they have most people focus on what they can get next. One of the most important things that we can do to improve our lives is to express gratitude. Learning to be thankful for what we have instead of always focusing on what we don’t is one of the most important mentality changes we can all make to improve our lives and our peace of mind. Expressing gratitude helps people readjust the way they see the world. It’s the little things in life we sometimes take for granted, but I assure you if those things were gone you would realize the huge impact they made in your lives. So, this Thanksgiving, take a moment to share and give thanks to the people who helped, taught, loved and inspired you. A few words of gratitude go a long way. Also remember you are a wonderful, special individual and that’s why they do the things they do for you. So, take a moment to express to them how much you care about them and the impact they made in your lives. I’m sure they will appreciate it more than you’ll ever realize. For more information on “Healing the Body Naturally” visit the complete herbal guide website. For more information about Stacey Chillemi, click here.